The driveway is unassuming. On one side of the lodge is a small garden apartment complex, where little kids sledded while big kids warmed up for a ski race. On the other side of the lodge is a public school. A short connector links a field to one side of the school with the ski trails. 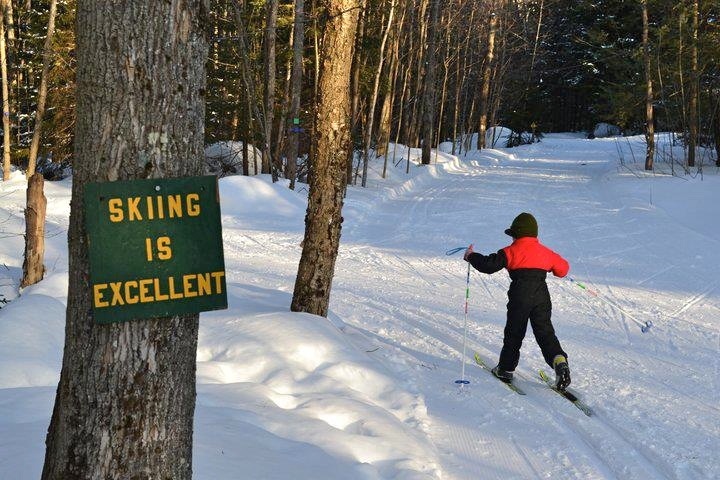 Presto, instant after-school ski training! Welcome to Dewey Mountain, just west of Saranac Lake town center. With 13 km of ski trails shoehorned into 30 acres, Dewey may not look big, but it packs a lot into a small ski area. And if you live nearby and don’t want to drive the 20 miles to Mount van Hoevenberg, it’s a great resource. Imagine being able to ski for an hour after work, during lunch hour, or after running errands on Saturday, right in your neighborhood. In late February, I drove there for Peru Nordic’s annual Cookie Clash. This 10 km race is a fundraiser for cystic fibrosis and, this year, it’s also for a new lodge. The 2.5 km race loop started with a few hundred meters of flat or gradual uphill. Then you hit the relentlessly steep Killer Hill. Once over the top, a gradual downhill builds your speed, morphing into a narrow, curving plunge requiring utmost concentration. Even with little vertical gain, the serpentine final 300 meters was the most technically demanding part of the loop. Imagine skiing that at Tuesday night races every week, every winter, and you know why Bailey et al are so good. Owned by the town of Harrietstown, Dewey Mountain has been managed by the outfitter Adirondack Lakes & Trails for the last nine years. The first trails were cut four feet wide, on both sides of Route 3, in 1979. 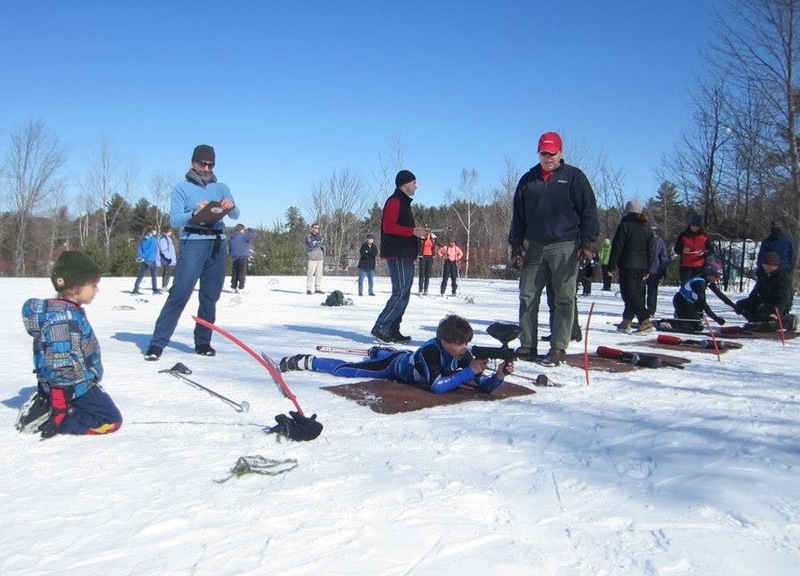 Saranac Lakes high school ski team trained on those trails. According to manager Jason Smith, sometime in the 1980s, the trails were widened and lights were added for night skiing. A few years ago, local resident Mary Thill reached out. “I love Dewey Mountain and I want to help.” She didn’t know anything about running a snowmobile or grooming, but she’s master at fundraising. Mary crafted and mailed an appeal letter. At that time, Dewey’s grooming quiver included a section of chain link fence, a section of culvert, and one of the original 1980s tracksetters. As a result of Thill’s first appeal, donations poured in that paid for a new groomer. A subsequent fundraiser raised enough money to purchase a new snowmobile and make trail improvements. Dewey bought culvert pipe, a skid steerer, and rented a mini excavator to dig ditches and pick up rocks. 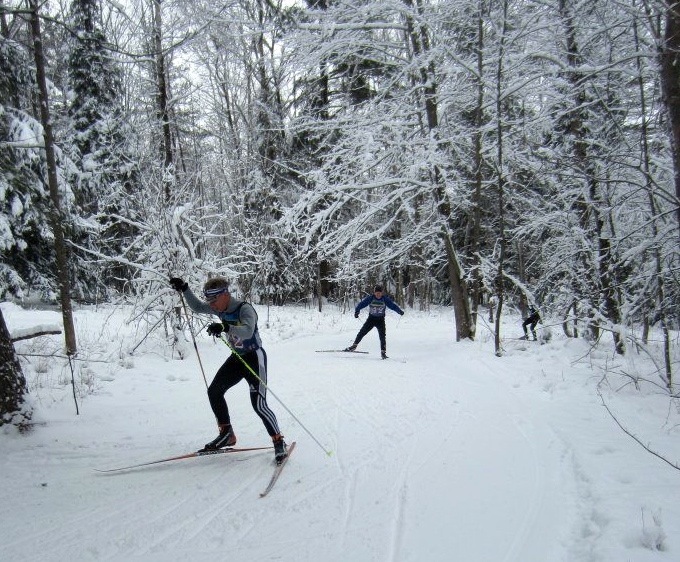 As a result, many of the trails are buffed out and skiable with a minimum of snow cover. Where it used to be “hard to follow a loop,” Dewey developed a directional flow to trail layout. New signage – purchased through another fundraiser – helps make sense of the trail system. 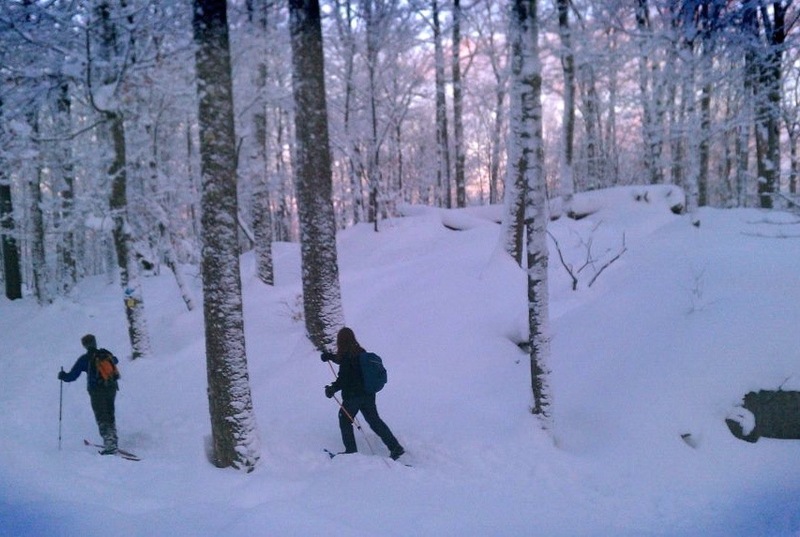 The upper portion of Dewey’s trail system is ungroomed; Jason calls it “classic northeast switchback skiing” and many people show up strictly for the backcountry trails. There’s always something going on here. Whether it’s a snowshoe race, the night race series, or paintball biathlon. Dewey Mountain has a strong youth ski league attracting over 50 kids ages 6-13. Funded by grants from Uihlein Foundation, Ironman Foundation, Kiwanis and others, their ski scholarship program helps kids afford programming fees and equipment. While Dewey Mountain gets more winter visitors, mountain bikers can check out the trails in summer. The Bark Eater Trail Alliance has helped lay out new trails for summer use. With its growth in visitors, Dewey Mountain is raising funds to replace the original lodge. View a design concept and, if you’re so inclined, make a donation to Dewey. The Uihlein Foundation is offering matching funds for donations towards the new lodge. And the next time you’re in the North Country, make a trip over to Dewey Mountain. This little known gem deserves your attention. One thing that I did not emphasize in this piece: Dewey is seeing an increasing number of non local visitors. My apologies for the omission! 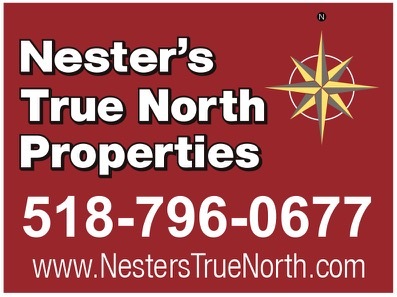 Thanks for a great write-up. Sounds like we all had a good winter! PS The other elite Dewey “kid” to watch is Annelies Cook, a member of the U.S. Biathlon Team and a leading candidate for the 2014 Olympic team. She’s one of the fastest downhillers in biathlon, a skill for which she credits Killer Hill.